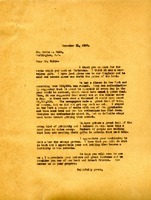 A letter from Erwin A. Holt to Martha Berry, enclosing an Armistice Day gift to the schools, and telling her of his conversations with others about the schools. 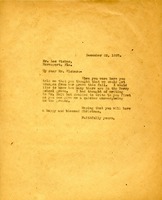 Berry writes to thank Holt for the books sent at Christmas. She indicates that the school has received the "wrong kind of publicity" and expresses concern about the ability to raise money. Berry also expresses gratitude to Holt for looking after the orange groves. 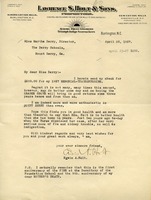 Mr. Holt writes to inform Martha that Mrs. Beach would be delighted if she could visit Berry. He also inquires about the orange Grove Martha has and how many seeds the oranges contain. He also explains things about his own health and discusses spring water. 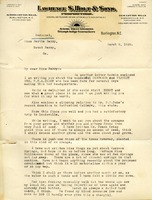 He also commends Mr. or Professor E. R. Vaughn's work in the Berry News. Martha Berry is requesting an estimate from Mr. Wicker of the number of oranges the Berry grove will yield this year and wishes him a happy Christmas. 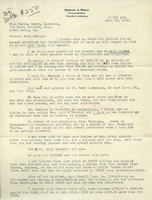 Erwin writes to Martha with a donation to the Berry School, hoping it finds her in good health and hopes to donate more when the Orange Grove will bring in good returns. 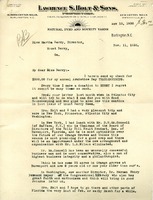 Mr. Ochs encloses a letter written to him about the appeal for Berry he sent out and includes an article from the Charlotte Observer.